Raffi Hovannisian, the main opposition candidate in the Armenian presidential election, again rallied thousands of supporters in Yerevan on Friday to declare that he is committed to continuing a fight for de jure presidency after all his offers of compromise have been rejected by President Serzh Sargsyan. Hovannisian, the head of the opposition Heritage party, gathered people in Liberty Square to present details of his previous day’s closed-door meeting with Sargsyan, whose election victory he is disputing. Hovannisian, who was Armenia’s first Minister of Foreign Affairs, has called his campaign the “handshake revolution”. The 53-year-old United States-born lawyer, who officially polled close to 37 percent of the vote in the February 18 ballot, as opposed to Sargsyan’s official count of about 59 percent, said all of his offers made to Sargsyan, including concession of people’s victory, appointment of new elections or a runoff, punishment of all election falsifiers, and even holding fresh parliamentary elections according to an all-proportional system of representation have been rejected. 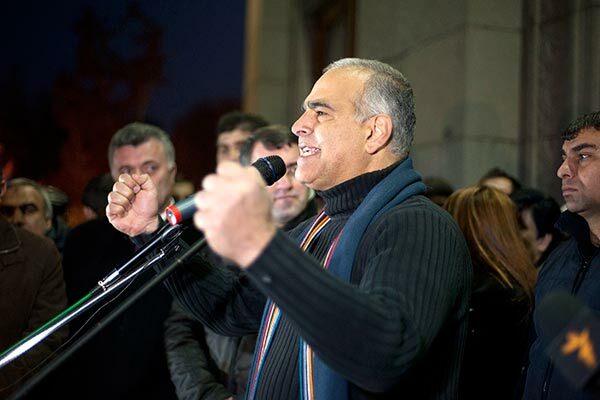 Hovannisian, whose rally has been hailed by politicians representing other parties, including Armenian Revolutionary Federation representative Armen Rustamyan, declared the start of his struggle, announcing that he will be organizing similar rallies in Armenian towns on Saturday before returning to Liberty Square in Yerevan for a big Sunday rally. He also repeated his appeal to the people to remain peaceful and abide by a constitutional means of reaching resolution. Earlier in the day the Heritage Party leader held separate meetings with U.S. Ambassador to Armenia John Heffern and Ambassador Heidi Tagliavini, the head of the OSCE/ODIHR Election Observation Mission, to discuss the post-election situation in Armenia. No other details of the meetings have been reported. In their earlier comments representatives of Sargsyan’s ruling Republican Party of Armenia rejected claims by Hovannisian that his votes had been stolen from him, insisting that the opposition leader and his team have lost “the sense of reality”.